Journey Biography, Discography, Music News on 100 XR - The Net's #1 Rock Station!!! Journey began life in San Francisco, Clifornia USA, in 1973 as a five-man band whose music was initially described as instrumental Jazz-Rock; the original line-up included guitarist Neal Schon who joined Santana at age 17, George Tickner on rhythm guitar, Ross Valory former bassist for Steve Miller Band, another former Santana member, keyboardist Gregg Rolie and drummer Prairie Prince. The group's eponymous debut, released in spring 1975 on Columbia Records, was moderate hit peaking at #134 on the U.S. Pop Albums chart; Tickner departed shortly thereafter and Prince was replaced by Aynsley Dunbar on drums. Journey's second album, "Look Into The Future", arrived in early 1976 and was essentially a reprise of their debut, it reached the #100 in U.S. National Pop chart. One year later the quartet tried for shorter tracks to increase accessibility, the resulting LP, "Next", peaked at #85 on the Pop Albums Sales list. The band changed gears with the fourth album "Infinity", which was released in early 1978 and also marked the debut of new singer Steve Perry; the record hit #21 on the U.S. Top 200 LPs & Tapes chart spawning three charting singles, the FM staples "Wheel In The Sky", "Lights" and "Anytime". 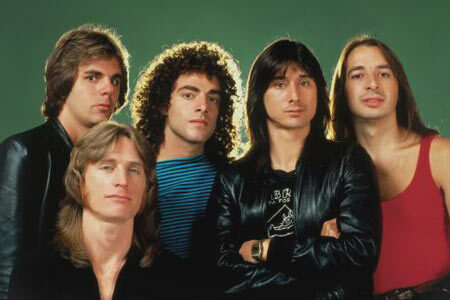 A year later, there was a line-up change when Dunbar was fired and subsequently replaced by drummer Steve Smith; the revamped Journey finally released their fifth album, "Evolution", in April 1979; it quickly became the band's biggest-selling album, moving over 800,000 units in less than three months, reaching the top 20 of the U.S. Pop chart on the back of the smash single "Lovin', Touchin', Squeezin'" which hit #16 on the Pop Singles chart, the follow-up single, "Just The Same Way", reached the #58 in the same chart. The group's musical development coincided with their growth in popularity and with "Departure" Journey were catapulted to new levels of stardom; upon its spring 1980 release, the album rose to #8 on the Top 200 LPs & Tapes chart and got off to an explosive start with the driving riffs and chorused vocals of "Anyway You Want It", the track, released as a single, hit #24 on the Pop Singles list; the band toured extensively throughout the year and released one more American Top 40 hit, "Walks Like A Lady", as well as a further Hot 100 entry with "Good Morning Girl". In early 1981, the band released their first live album, a double-disc set entitled "Captured"; it was another commercial success, peaking at #9 in the U.S. and included a couple of previously unreleased songs, "The Party's Over (Hopelessly In Love)", which rose to #2 on The Mainstream Rock list and hit the American Top 40 chart; the second single, "Dixie Highway", entered the top 30 of the Billboard's Rock chart. That same year Journey went for the first time in the studio with their new keyboardist Jonathan Cain, formerly of The Babys, who replaced Rolie, they recorded their masterpiece, "Escape" which was issued in August; this album shot to #1 on the Billboard Magazine's Top 200 chart and was eventually certified nine times platinum; it produced a string of smash singles including the superb "Who's Crying Now" which hit #4 on both Pop Sales and Mainstream Rock Singles charts; "Don't Stop Believin'" cracked the top 10 in the same charts and "Stone In Love" reached #13 on The Mainstream Rock chart; the two final singles, the power ballads "Open Arms" and "Still They Ride", peaked respectively at #2 and #19 on the Pop chart. In 1982 Journey also provided two songs on the soundtrack for Disney's movie "Tron", one of which, "Only Solutions", became another Mainstream Rock hit single. The quintet released their eighth studio record in February 1983, "Frontiers" debuted at #2 on The Billboard Top 200 Albums chart and managed to give Journey four top 40 hits, with "After The Fall" and "Send Her My Love" both reaching #23, the classic power ballad "Faithfully" at #12 and "Separate Ways" peaking at #8, the latter of which was the only Mainstream Rock chart entry at #1. The following year, while the band was on a brief break from touring and recording, lead singer Steve Perry issued his first solo album, "Street Talk", which rapidly approached the double-platinum mark. In 1985, Journey scored a major hit with "Only The Young", a song taken from the soundtrack to "Vision Quest", the single peaked at #9 on The Billboard Hot 100 and smashed into the top 3 of The Mainstream Rock Tracks chart. Following the departure of original bassist Ross Valory and drummer Steve Smith, the band resurfaced in May 1986 with "Raised On Radio"; Perry, Schon and Cain then enlisted a new rhythm section comprised of bassist Randy Jackson and drummer Larrie Londin, this album itself was yet another huge success in the U.S. where peaked at #4 on the Top 200 Sales chart running away with double-platinum honors; it produced a stream of hits including "Be Good To Yourself" which rose to #2 on The Mainstream Rock Tracks chart and peaked at #9 on The Billboard Hot 100; "I'll Be Alright Without You", "Girl Can't Help It" and "Suzanne", all entered the top 20 of the Billboard's Hot 100, the latter two also reached #9 and #11 respectively on Mainstream Rock list; the title-track was a further Billboard's Rock airplay top 30 entrant and the sixth and final single, "Why Can't This Night Go On Forever", reached the #60 on The Billboard Hot 100. 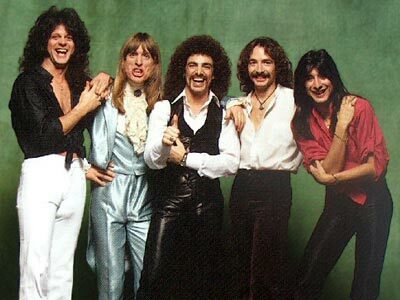 Journey supported the album with an extensive tour after which the band split up. During 1988, Schon and Cain teamed-up with John Waite forming the supergroup Bad English and Columbia released a compilation album simply titled "Greatest Hits" which spanned Journey's career from 1978's "Wheel In The Sky" to 1986's "I'll Be Alright Without You"; the set hit the top 10 of The Billboard 200 and became the band's top-selling record as it was certified 10 x platinum in the U.S. in 1999. The band appeared in the top 40 of The Mainstream Rock Tracks chart in 1993 with the single "Natural Thing", one of the previously unreleased tracks featured on the triple-disc set, "Time 3". The band reconvened in the fall of 1995, with Cain, Perry and Schon leading Journey once again and bassist Ross Valory and drummer Steve Smith behind them, the quintet recorded its tenth album of new material, "Trial By Fire", which was released in October of the following year; it debuted at #3 on The Billboard Top 200 chart spawning "When You Love A Woman" which hit #12 on The Billboard Hot 100 and the Active Rock top 20 hit, "Message Of Love". When the band got back together to make a new album, Perry and Smith were no longer in the line-up, the remaining members recruited vocalist Steve Augeri and a new drummer, Deen Castronovo, Schon and Cain's Bad English bandmate; the revamped Journey delivered "Arrival" in spring 2001, an album which failed to repeat the success of its predecessors; it reached a modest #56 on The Billboard 200 list and contained only one Adult Contemporary charting single, "All The Way". The quintet returned in October 2005 with "Generations", the band's twelfth studio album and the first on Sanctuary Records; it contained the album-Rock radio single "The Place In Your Heart". 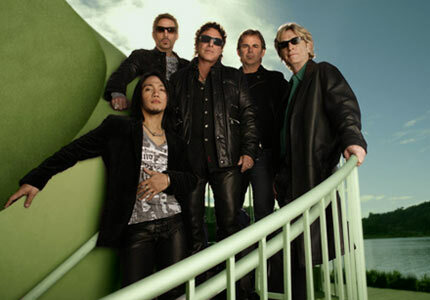 Three years later Journey released "Revelation", their first album with new lead singer Arnel Pineda. The set came out as a double CD with the first featuring 12 new songs written by Schon and Cain and the second included new studio recordings with Pineda of 11 of the group's classic hits. "Revelation" was enormously successful, peaking at #5 on The Billboard 200 and was eventually certified platinum by the RIAA. In May 2011 followed "Eclipse" which reached #13 on The Billboard Top 200 Albums chart.